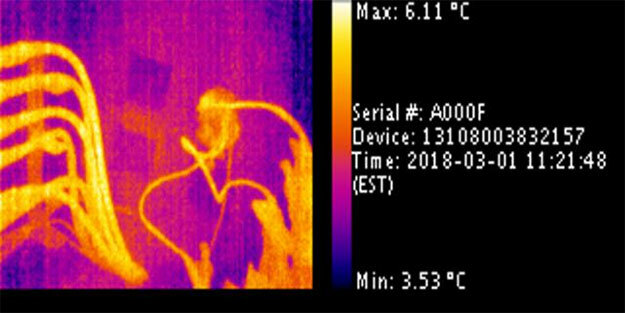 Infrared (IR) and its ability to ‘see’ in the dark can be deployed as part of a broad spectrum underground monitoring system where infrared can detect overheating electrical wiring or materials involved in spontaneous, low level combustion. Infrared itself was discovered as early as the 1800s, with IR or thermal imaging cameras originating from their development for military use. Now widely used in a variety of industries rendering infrared radiation as visible light, these cameras are valuable where emergency services are operating in low or zero light levels, such as enabling firefighters to see areas of heat through thick smoke or complete darkness, or rescue crews to pick up body heat where people may be trapped under buildings, snow or landslides. Law enforcement also make good use of IR to track and apprehend suspects during night time surveillance operations or crime investigations. Apart from high profile use by emergency services and law enforcement, IR cameras are now extensively used to assist engineers in locating thermal-related issues or faults in the energy transmission and distribution industries; discovering overheating connections, leaks, blockages, failed insulation, early component failure and enabling predictive maintenance. Other areas where these cameras are effective include the medical profession and building inspection. Infrared or thermal imaging cameras are able to analyze the thermal energy emitted by objects or environments to produce visible representations called thermograms. These images can be used for inspection, diagnosis or evaluation of the environment in relation to the temperature differences of surfaces. Further processing of images can be undertaken to provide more accurate reporting and multiple color palettes are available to enhance the temperature graduation displayed. Visual cameras can be deployed to complement the use of IR technology to give a more comprehensive picture of the electromagnetic spectrum. “CNIguard’s latest generation of MANITOR asset monitoring system is equipped with both IR and visual cameras that can be pointed towards specific assets or used to give a wider view of an environment to monitor thermal characteristics and capture visible images at regular intervals. A low power flash is used to illuminate the scene for visible image capture underground or in other dark locations. Hot, loose, corroded or high resistance connections can be detected along with overloaded or unbalanced electrical supplies. “In addition, overheating components in transformers, motors and pumps can be determined early, along with fluid or methane leak detection from pipes being monitored. IR images sent from the MANITOR camera show the minimum and maximum temperature graduation scale for each image, serial number of the device and the time and date captured. Visible images from the visual camera can be overlaid to more accurately identify objects. “This combination gives the MANITOR a unique advantage over its competitors in locating faulty components or providing an indication of their early failure,” commented Ian Courtney, CNIguard’s Chief Technology Officer. To find out more about CNIguard’s Manhole Monitoring System with IR camera contact us.